How did women who had experienced freedom, adventure and paid employment during the Second World War respond to post-war demands that they ‘settle down’ and devote themselves to the needs of husbands and children? That was the subject of a lively discussion between the writers Elisa Segrave and Georgia de Chamberet at Waterstones’ Bloomsbury branch the other night. As they explored the contrasting experiences of two specific women of that generation, these fascinating individuals were poignantly situated in their historical period. 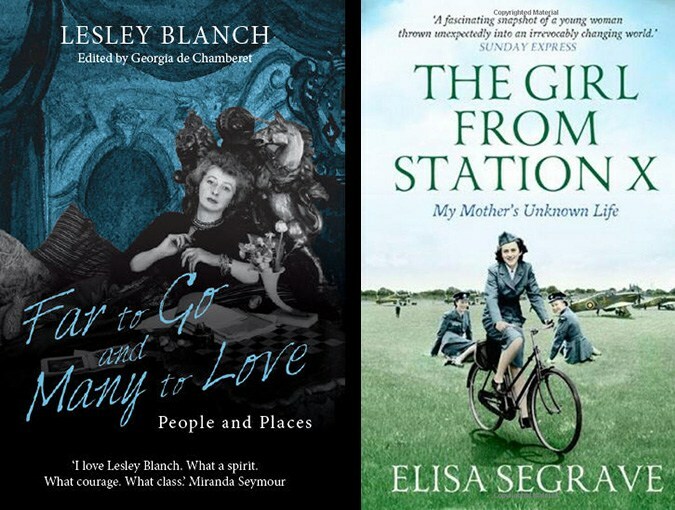 When Elisa Segrave was caring for her mother, then suffering from advanced Alzheimer’s, she came across a cache of wartime diaries that revealed a very different woman from the conventional if distant wife and mother she had known. In The Girl from Station X: My Mother’s Unknown Life (Union Books, 2013), Segrave discovers the woman her mother had once been: Anne Hamilton-Grace was an adventurous girl from a privileged background of finishing school and hunt balls, who had driven a Ford V-8 from Tunbridge Wells to Russia in 1938. Like all the others who worked at Bletchley Park, Anne never breathed a word of her wartime activities and, once the war was over, quietly assumed the role of housewife and mother. Her diaries cease in 1955, when her beloved five-year-old son drowned and she began a long, sad descent into depression and alcoholism. Georgia de Chamberet’s godmother, Lesley Blanch, was determined not to succumb to domesticity – and she never did. Born in Chiswick in 1904 to artistic but impecunious parents, she seized her opportunity to escape from suburbia when a mysterious Russian, whom Blanch only ever referred to in her published writing as ‘The Traveller’, entered their lives.Only many years later did she reveal that he was in fact the theatre director Theodore Komisarjevsky. He whisked her off to Paris, seducing her on the Train Bleu and introducing her to fellow Russian exiles such as Diaghilev, Rachmaninov and Chaliapin. Towards the end of her long life (she died in 2007, just short of her 103rd birthday), her god-daughter assisted her in writing the autobiographical essays that, along with a selection of her travel writing and an account of her volatile marriage to the French novelist and diplomat Romain Gary, form the posthumously-published memoir On the Wilder Shores of Love: A Bohemian Life (Virago, 2015). During the 1920s and 30s, after studying at the Slade, Blanch designed stage sets for Komisarjevsky and Marie Rambert, who became a lifelong friend. She also produced artwork for the London Underground. After Komisarjevsky left her for Peggy Ashcroft in 1933, Blanch acquired a set (an apartment) in Albany, where her neighbours included the theatre critic James Agate, Philip Gosse and Dorothy L Sayers, who, she recalled, ‘had an attractive voice and was usually alone, drinking wine’. Blanch’s theatrical and artistic flair carried over into her next career, as a journalist. A new collection of her profiles, essays and travel articles, Far to Go and Many to Love: People and Places (Quartet), has been edited by De Chamberet, who also provides an absorbing biographical introduction. Illustrated with period photographs and a selection of Blanch’s stage designs and other drawings, the articles range from the 1930s to the 1980s, and include several unpublished manuscripts found among her papers. Her opening salvo as a journalist appeared in Harper’s Bazaar in 1935. Entitled ‘Anti-Beige’, it was in effect her manifesto, the declaration of a lifelong war against dullness, convention and timidity that found expression in brightly coloured clothes, Middle Eastern robes, floating scarfs, beads and bangles, long before the hippies made such attire fashionable. But this flamboyant romanticism concealed a determined professionalism, and the article landed her a job on British Vogue, on which she served as features editor from 1937 to 1944, writing articles on women’s war work, often illustrated by her friend, the photographer Lee Miller. Blanch’s acute observations of places and people can be found in pieces on subjects as diverse as polygamy, souks, picture postcards, the Orient Express, Christmas in Mexico and life in post-war Bulgaria. Her travel pieces are all the more poignant in view of the subsequent fate of many of the places – Kabul, Aleppo, Palmyra – she describes so vividly, and the collection as a whole forms a richly engaging record of a life lived to the full. Both books provoked fascinating contributions from audience members about their own experience and that of their parents’ generation, and this summer evening in Bloomsbury also engaged with the ideas, issues and choices that face young women as they create, write and engage with life today, and the continued relevance of inspirational women from the past.